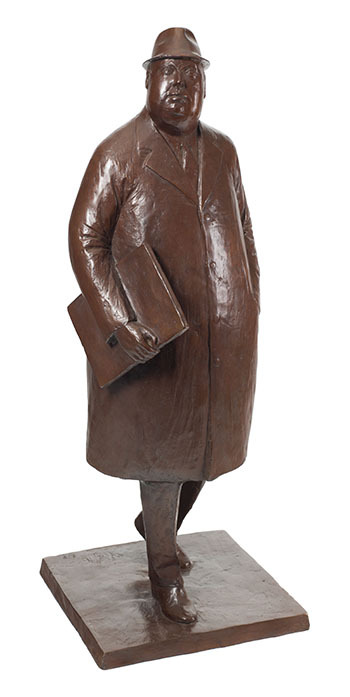 William McElcheran’s businessman is symbolic of the structures of society. 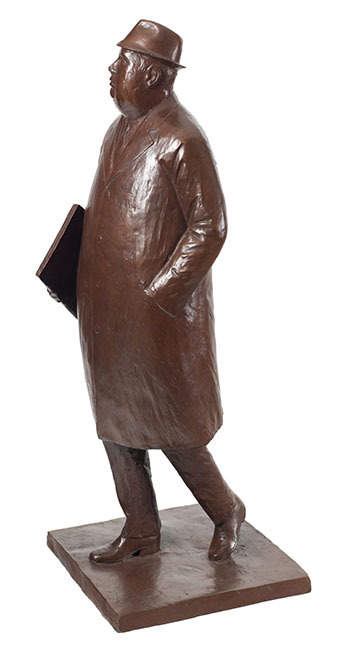 His earth-bound solidity is expressed by his volumetric body cast in bronze, clothed in the classic business costume of coat, tie, hat and briefcase. McElcheran identified the businessman as “not only a result, but at the same time a protector of the industrial age which is based upon the whole theory of the division of labor.” He believed we were at the end of that time, moving into a post-industrial age. Thus McElcheran creates a sense of nostalgia for these men, who are driven to succeed, to acquire, to conform, to attain power, yet are controlled by their own system. We sympathize with them because McElcheran imbued each of his figures with hints of a distinctive personality—he felt that “inside he has little fantasies which he keeps for himself.” McElcheran may satirize his businessman, but in a manner that is sympathetic rather than destructive. Archetypes of our times, these businessmen are players on the stage of life, and we empathize with their sense of purpose and their belief in their way of life. 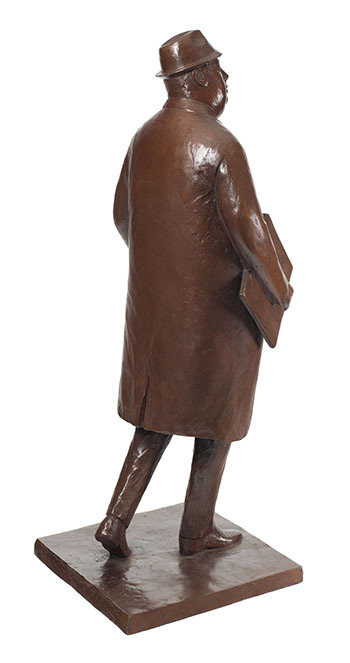 The bronze base measures 11 1/4 x 11 1/8 x 1 inches. Nous avons fait en sorte d'assurer l'exactitude de l'information affichée, mais des erreurs ou oublis peuvent se produire. Toute acquisition est soumise à nos modalités et conditions.